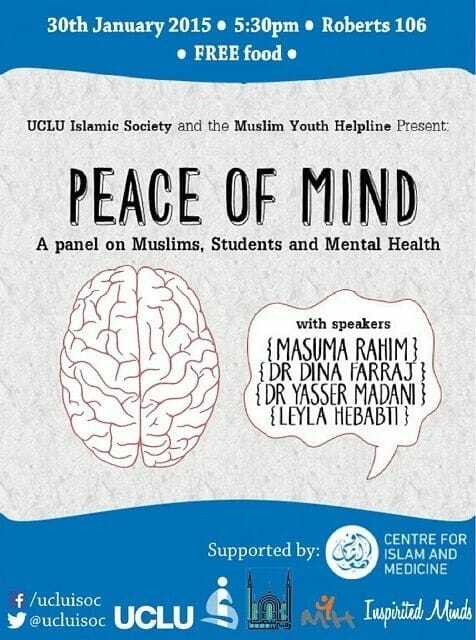 UCLU Islamic Society, in association with Inspirited Minds, the Muslim Youth Helpline, and supported by The Centre for Islam and Medicine, presents UCL ISoc’s inaugural mental health awareness event, ‘Peace of Mind’. There is a massive cultural stigma surrounding mental health within the Muslim community, and this must be challenged in order to allow Muslims to receive the help and support they need should they find themselves in such a situation. The panel of experts will be discussing causes of the most common mental health issues among Muslims, diagnosis and treatment available, as well as a survivor’s story. Because it is a Friday evening UCL ISoc will be providing some extra great FREE food, and this event promises to be an excellent, informative event, with a Q&A at the end insha’Allah so be sure to come along! UCL & non-UCL students & professionals… basically everyone is welcome! Next PostThe question is why?